I love smoothies. I always have, but pregnant me has an obsessive problem with them. Thankfully, my 2 year old loves them too and my husband tolerates them enough to make me happy by drinking them when I make him one (even though I’ve caught him “hiding them” and saying he drank the whole thing). Until this point, I’ve been making them with a hand-held immersion blender. Classy, huh? A blender was just not one of the things that was super important to me around wedding registry time, so I always bought the cheap-o ones from Target and used them until they broke…. Or couldn’t blend ice anymore. A few weeks ago we went to Costco to buy a new rug for our son’s room. We never have time for that sort of thing, so when we got there and realized that the rug wouldn’t fit in our car with passengers, we decided that we needed a blender instead. I’ve been asking for one for a long time now, but again, it’s just not the kind of thing I wanted to spend money on, being that the immersion blender works well enough. When we got home from Costco, Remy was insistent on an afternoon “moothie machine”, so naturally, we obliged. Oh my. It was amazing. Typically my chia seeds are just a super crunchy additive to our smoothies because an immersion blender isn’t strong enough to cut them up, but this guy is!!! Over the past week, we’ve been at my in-law’s house, without our Nutribullet. However, they have a super fancy Vitamix. You may think I’m insane, because I’ve literally dreamt about buying a Vitaxmix, but I prefer my Nutribullet!!! 1. For one thing, the NB is WAY cheaper, so if anything happens to it (#toddlerlife and clumsy pregnant lady), it’s much cheaper to buy parts for or replace. 2. It GRINDS CHIA SEEDS. 3. My crazy toddler can carry the basin around and help me make his “moothies” without fear of it being too heavy or breaking. 4. It takes so little room on my already cramped counter tops. I just put the base between my slow cooker and stand mixer, and you can’t even see it. I also keep the “cups” in the cupboard right above it, next to the protein powder and Vitamineral Greens, for easy access. 5. It’s so easy to wash!!!! Like, SO easy to wash, I actually do it and don’t leave it “to soak”… Cuz we all know that’s code for “doing it later”. 6. It makes just enough for the 3 of us in the big size cup, but if I want something different than the boys, there are other cups size options I can use for myself too. 7. The “sippy cup” tops! If I’m running late and am the only one who wants a smoothie (this has yet to be the case, but at least I’m prepared), I can toss a to-go cup lid on it and take it in my car or to my office. Adult sized sippy cups for me, please! 8. I don’t need to make soup in a blender. If I need to blend a soup, I have an immersion blender for that. Ask my father-in-law to share how many times they’ve used the Viamix for making actual soup (Papa, please share that number in the comments!). I’d probably use it that many times too. So there. I’m so happily content with my $75 purchase and am happily advertising their product (on my own, no sponsorships required!) to help you figure out what to spend your $500 on that’s not a blender. You know, spend money on one of these, or one of these, or one of these. Just put the lighter weight stuff in first, colder/heavier items on top, screw the blender cap on, flip upside down and plop it on the base for a minute or so! You can also add whole fat Greek yogurt to the smoothie, or a scoop of probiotic powder, if you need more fat or probios for any reason. Every Monday, my friend Kristina posts her Monday Mom Confessions. I love reading her self-proclaimed confessions and have decided to link up with her and start posting them myself! If you have a toddler, you’ve likely started waiting to stuff your face full of dessert until after bedtime, lest the smallest bite of something sugary keep your little monster up way past your “you time” at the end of the day. Missing my “me time” or “husband time” (on the few nights a week he’s home) makes me cranky, and with a budding baby in my belly, it’s more necessary that ever to get my perfect (and totally un-sleep trained) boy down for the night. Come on, I mean, it already takes a solid hour+ to get him to sleep, so whatever is left of the night is all mine (screw laundry). Sugar be damned. Last night, we got some great news. Our home that we’ve been living in (renting) for several years was recently sold. Our new landlords bought the duplex under the agreement that they would be living in one of the two units… which are both currently occupied. We live in a beautiful, old building from the 1920’s that has two identical units. One of top of the other. We used to live upstairs, and now we live downstairs. Needless to say, we love our building, we love our neighborhood, we love our neighbors and we love living in the middle of the city, where everything we need is incredibly close by. People say LA has the worst traffic, but they just live in the wrong place. 🙂 Anyway, for the last 2 months, we’ve been waiting for the new owners to let us know which one of the two units they planned on moving into. We knew that LA’s rent control laws protected us (we’ve lived there longer than our upstairs neighbors), but that doesn’t mean that the new owners would follow the rules. We were just nervous. The idea of being uprooted just a few months before the new baby comes, and in the middle of finals for my husband, was terrifying. On to the good news – Sunday night, the new owners came over to “discuss their plans for the house” and the end result is that we get to stay!!!! How does this relate to my MMC??? Well, in of the excitement that the new owners brought with them, we needed cake. Thankfully, we live within walking distance to the BEST bakery in LA (in my opinion), Sweet Lady Jane. Onward ho! We marched ourselves straight to SLJ for some cake… and 7:00PM on a Sunday night. Shoot. 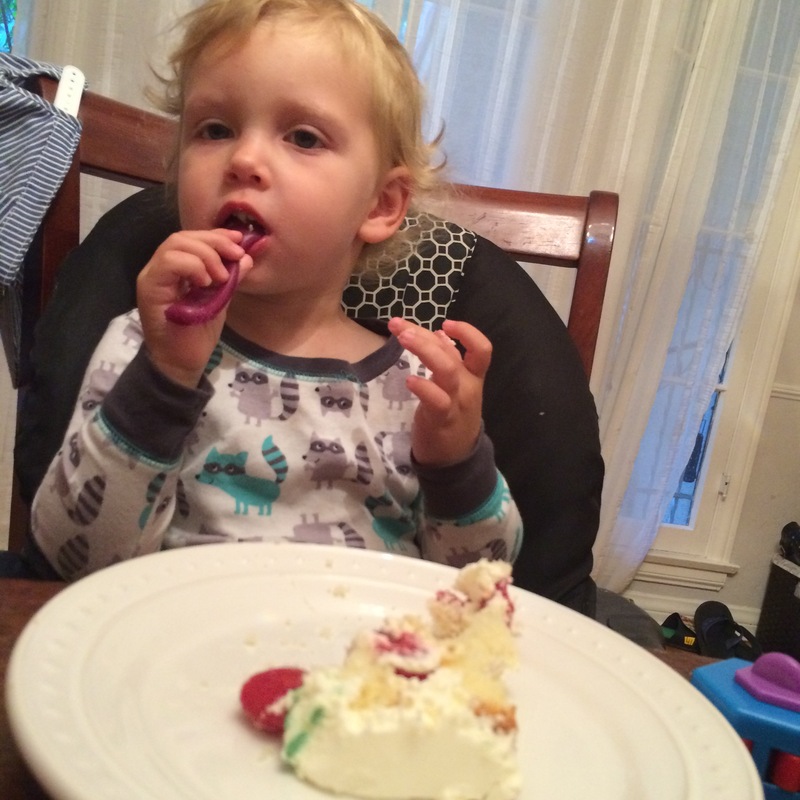 Remy can’t eat cake at 7:00PM or he will NEVER SLEEP AGAIN!!! Our evening of watching House of Cards will be damaged and a sour bedtime on a Sunday night, just leads to a rough(er) Monday morning. Waaaaaaaahhhh. We walked back home with our cake in a togo box, and my excited little man cried when he only got ONE bite (mostly blueberry) of his triple berry shortcake, before bed. But here’s the best thing – CAKE MAKES A GREAT BREAKFAST. Especially when it’s loaded with fruit (triple berry) and milk (lots and lots of whip cream frosting). Cake is a grain, right? We’re talking BALANCE. The ultimate confession? He’s at daycare today. If he goes bonkers on a sugar high… He’s on someone else’s watch.